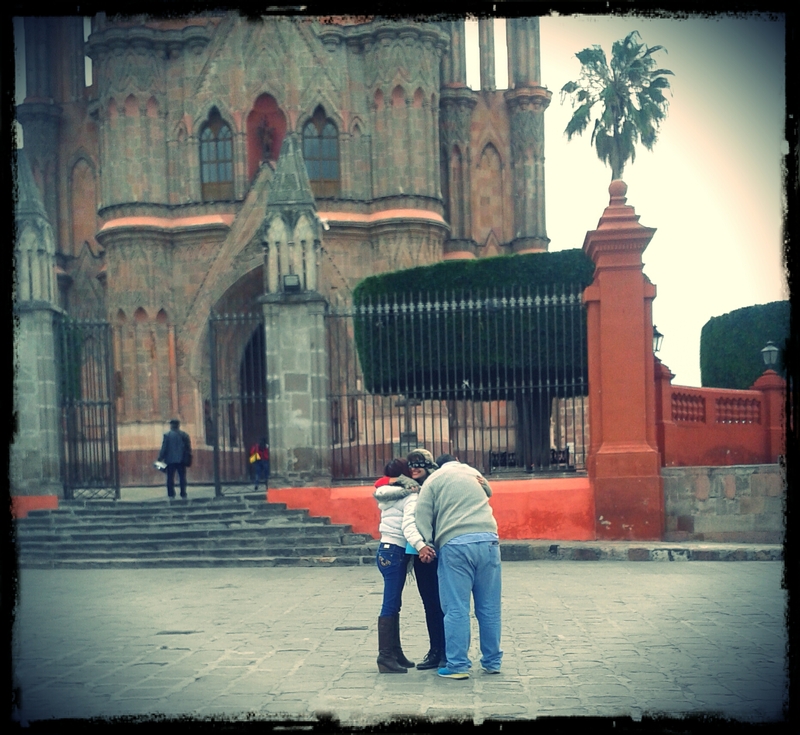 So in San Miguel de Allende, where I live, there’s a beautiful church that stands erect facing the main square. It’s absolutely stunning and everyone that comes here at some point gets a picture of it. It’s our very own Eiffel Tower, if you will. Well, a couple of weeks ago I was inspired by a YouTube video going around that featured a blindfolded man hugging strangers. I thought to myself, “For February, I’m doing that.” I don’t know what inspired me to do it, but I thought for sure it was a great idea. The whole concept between “Free Hugs” has always been a great one, but I felt it was too intimidating for some people, and the role that it would put me in was too intimidating for me. I liked the element that this particular man had added to it, by blindfolding himself and making it about trust. It was like an extra added challenge, or a more attractive intention for me. My intention would be to vulnerably, and blindly, give love to the world. Without actually expecting anything in return, but still inviting people to trust me or love me back, which in itself was probably the initial challenge. 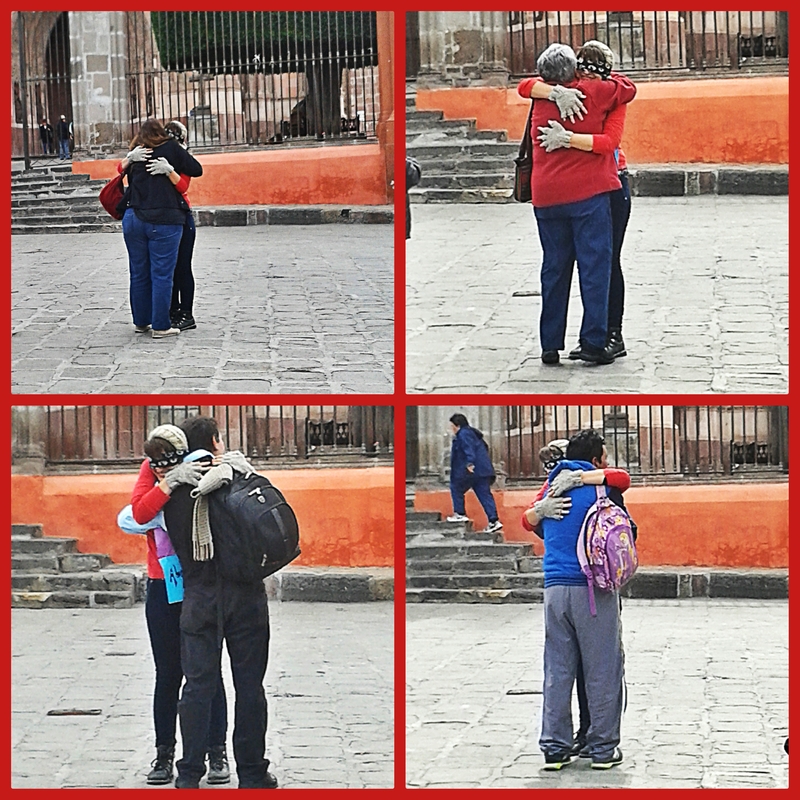 I went with my best friend here in San Miguel, Natasha, who took pictures and documented some of the hugs. The plan was this, I would stand in front of the Parroquia, with a bilingual sign around my neck (given the bilingual culture of our town) telling people “Let me trust you. Abrazame” (“hug me”) blindfolded, and arms stretched out. Right before I went ahead and did it, I stood with Natasha and proceeded to freak out for about 10 minutes. “What if no one hugs me?” I thought. “What if no one does?” the voice in my head asked back. I decided that I wasn’t actually doing this to get hugs, I was doing this because I wanted to give. I wanted to challenge myself in how I gave, in how I showed my love and affection. I wanted to be loud and intentional with my love giving. So I put on my blindfold and said, “let’s do this”. She led me to the spot we had previously decided on and then she sat somewhere where she could watch the oncoming love. I outstretched my arms, and tried to smile. I set out the intention of simply loving. I stood there, and loved, no matter who or what was going on in front of me. I didn’t care if people did or didn’t hug me, I didn’t care what they thought. I considered myself an art installation. 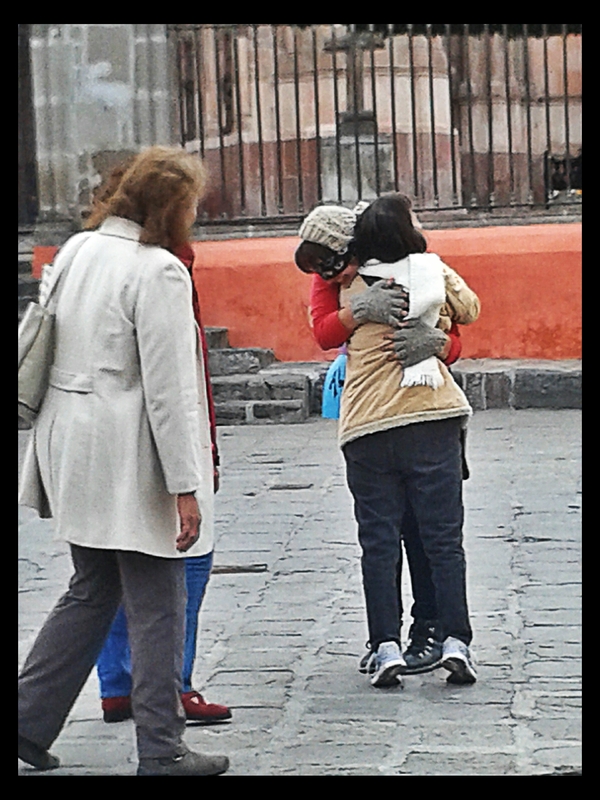 However not even 5 minutes went by, and my first hugger came forward. I hadn’t really thought about what to say or do so I said “have a nice day” and stuttered and stammered a bit trying to figure out what else to say. By the time she pulled away however and had walked away, I felt free. It was a great high. I had had one hugger, that’s all I needed. I must have hugged about twenty people. By the time the 30 minutes were up, I had a mental collection of people’s reactions. I was already going through the mental album I had made of the different approaches people had taken to hugging me and being around. Some had made jokes (some to my expense) others had dared each other, others had hugged me in more a “receiving” fashion while others hugged me in more of a “giving” fashion. 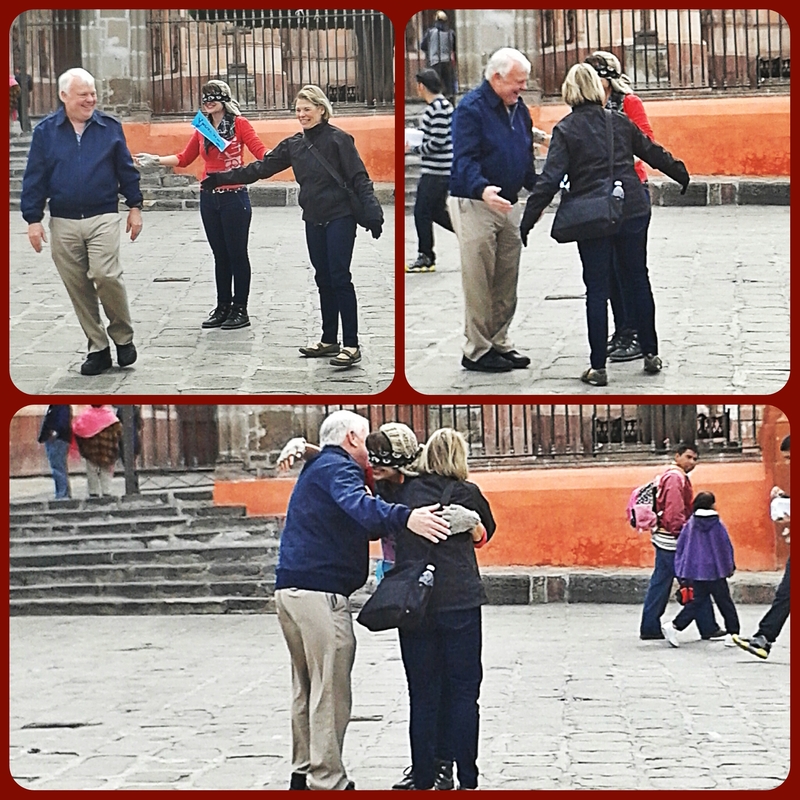 It was all ages and genders, most people gave full body hugs though some people did do side hug or pelvis out hug. I delighted myself in going through the memories I had just collected and took a breath in. The town looked different, colors were brighter, people se emed smilier. I felt high, on cloud 9, completely in love with love, with people, with life. I took the feeling with me for the rest of the day, and night. I had a fantastic day and night, and had so much love that I wanted to give everyone else. And sure enough, I see people respond to it. People talked to me more excitedly, smiled more, were more interested in me, and in telling me about themselves. It was an experiment in loving and love and being loving. It was an experiment because I didn’t want to think about Valentine’s Month as some capitalist month where single people should be depressed and cursing love. Instead, I wanted to bring back February as a month of Love with a capital L, to give love and be love, to give goodness and share friendship. How people respond so well to it, how it’s hard for someone to turn you down when you meet them with love. So today, I urge you, if you are bitter or sad about the fact that you aren’t receiving love, remember that it doesn’t mean you can’t in fact give it, and that giving love usually results in receiving it. Sharing love means being love, means linking with your truest most authentic self. Pushing it away will ever only result in pain. So enjoy today, enjoy yourself, be love, do love. All is well.